Michael’s creative writing began with song lyrics. News articles followed then short stories, poems and the longer forms of novella and novel. Over the last few years, one form or another has temporarily elbowed its way to the top of his to-do list, but most of the time, the forms get along happily together. Perhaps it’s the common thread of humour that runs throughout his work that keeps the peace between the short story and the poem; between the novel and the novella. You know the sort of thread – the type that has a tantalisingly tuggable loose end. After practising professionally as a Chartered Surveyor and an Environmental Manager, Michael studied for a MA in Creative Writing at Kingston University, gaining a commendation in 2014. He is a member of his local writers’ group, Anderida Writers ». Michael has won, been placed or short-listed in competitions run by a range of organisations including the Writers and Artists’ Yearbook, the Charleston Short Story Festival, the Labello Press, Northampton Writers, Chelmsford Writers, Nottingham Writers and Exeter Writers. In 2016 he won the Write Across Sussex Short Story Competition for ‘Scar Tissue’. Michael has also won prizes for his poetry including the Anderida Writers’ Poetry Prize for ‘A Piece of Cake’ and the Eastbourne Writes Festival poetry prize with his poem ‘Love’». 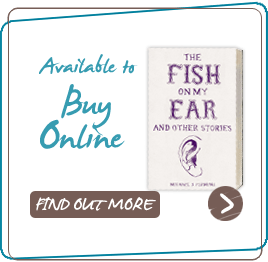 In 2012 he published ‘The Fish On My Ear and Other Stories’» a collection of tales which look askance at the infuriating inconvenience of death. Michael first directed his creative energy into song writing. He has written over 100 songs in a range of genres including ballads, Blues, Country, children’s and humorous. See Poetry & Lyrics ». His composition Vote! was intended to encourage everyone to go out and exercise their franchise and was recorded by him and his colleagues performing as The Council Tax Band. The Blotters page is there to update the reader, clamorous or otherwise, on Michael’s current work and take on life. See Blotters ».